Reflections of a Bookaholic: Goodreads Reminded Me That I'm a Terrible Blogger! Goodreads Reminded Me That I'm a Terrible Blogger! Oh Goodreads. 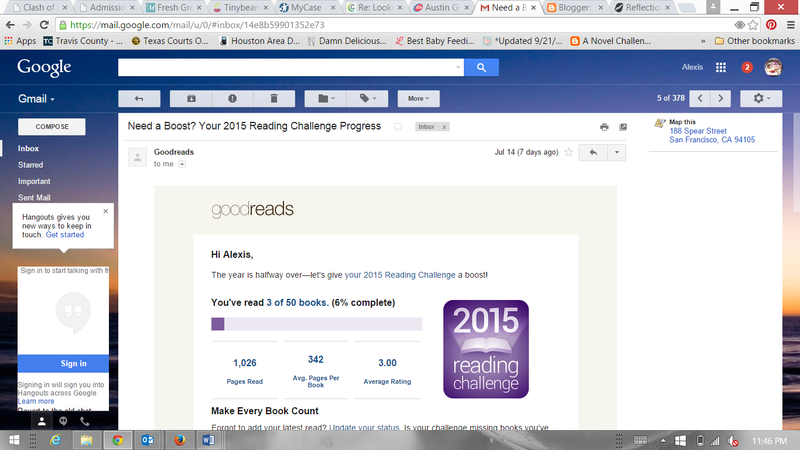 Thank you for your email reminding me that I haven't come anywhere near my reading goal. I appreciate the reminder that I cannot write reviews if I am not reading books. I get that. I also get that reading makes me happy and I want to be happy. I get that I have no excuse not read. Reading = Life. I should stop playing addictive mindless phone games and do something more fulfilling. I should stop making excuses about my lack of participation. And I will. BUT I really do have good reason. On April 30 (four days after my last post), I gave birth to a precious baby boy!!! And my life is nothing like I remember it. In fact, I'm so sleep deprived that my life before baby seems like a dream that I made up in my head. I even dreamed that I had a book blog that I used to spend hours and hours on. Sometimes my dreams include books and audiobooks. I'm not quite sure about that last part because when I wake up, I slowly start to forget the dream. Oh well. Miss you guys (and reading)! I've got a few posts up my sleeve (code for: I really want to show off pictures of my adorable baby) and I need some new book recommendations. Not that I read. But I hope to one day!! Hi Alexis! Congrats to you on your baby boy! I trust you are enjoying him thoroughly. When you have time again, because I know new Moms are pressed for it, you should try the Outlander series. The books are huge, but they are soooo good! ALEXIS YOU'RE A MOMMY??? CONGRATS!!! I hope you spam us with pics of hte little guy!